The risk of human rights tainted tungsten, tin, tantalum and gold (3TG) entering the supply chains of tech firms is extending well beyond countries considered to be the traditional source of the so called “conflict minerals,” used by armed groups to finance their war against established governments. African countries, particularly the Democratic Republic of Congo and those in the Great Lakes Region, are not longer the only nor the main providers of tainted 3TG, key to the production of high tech devices and batteries for electric cars, global risk consultancy Verisk Maplecroft warns. The company’s newly released Commodity Risk Service reveals that 3TG minerals are also being produced at sites under the control of armed groups in both Myanmar and Colombia in order to fund violence. According to their findings, the United Wa State Army is involved in tin production in north-eastern Myanmar, with output traced to Chinese factories producing electronic products. In Colombia, in turn, armed groups such as the ELN are currently in control of gold and tungsten mining operations. 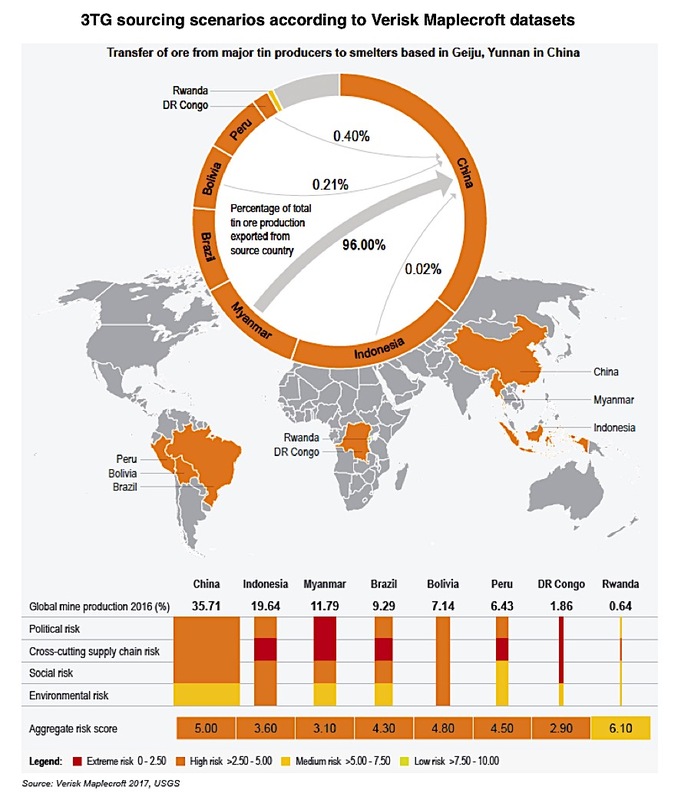 In its assessment of 20 key human rights and environmental issues related to the extraction of 3TG minerals globally, Verisk Maplecroft identifies tin as the commodity that poses the highest risk for labour rights violations. Outside of the DRC, the use of minors is extremely likely in three of the eight largest tin-producing countries – Bolivia, Myanmar and Indonesia – while five are also identified as “high risk” for forced labour, including China and Peru. Slavery, unfortunately, is still present is some of the producing nations, Brazil and the DRC, the researches say. Occupational health and safety violations are also widespread across the largest tin-producing countries. This is a particular issue in the informal mining sector, which sees artisanal miners and surrounding communities regularly exposed to hazards, including mine cave-ins and the spread of diseases such as malaria. Tantalum, widely used in the production of electronics, is also heavily linked to child labour, with the producing countries of Mozambique, Burundi and Rwanda categorised as ‘extreme risk’ for the issue. According to Verisk Maplecroft, child labour and other human rights abuses are much less likely to be an issue with responsible international mining majors, due to their application of best practice international standards. The problem for tech companies is they often don’t know if the metals used in their products come from irresponsibly managed operations – whether industrial or artisanal – as they lack visibility of their supply chains at the mine or smelter level. This leaves them exposed to the potential for their products to contain tantalum and other minerals mined by underage workers in extremely hazardous conditions. The report comes on the heels of the European Parliament approval of mandatory conflict mineral reporting rules for all of its member countries. It also follows a February decision by US President Donald Trump to review and likely scale back the Dodd-Frank law, which requires companies to trace and report whether their products contain minerals from a war-torn part of Africa, and on which the EU’s own law is based.